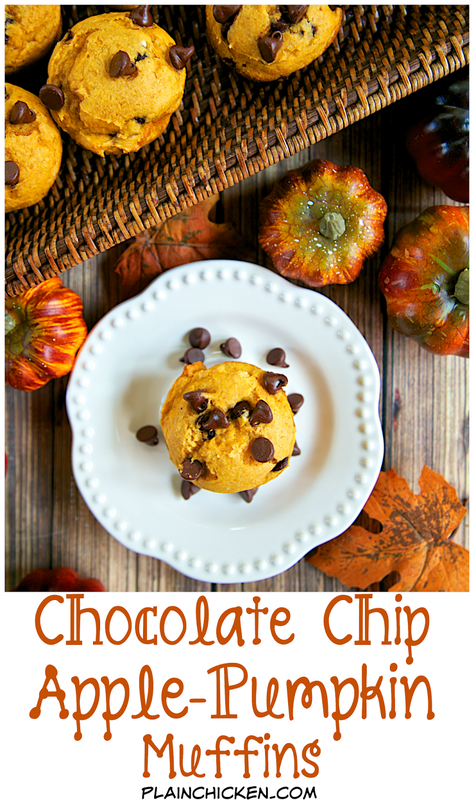 Chocolate Chip Apple-Pumpkin Muffins - SO easy! 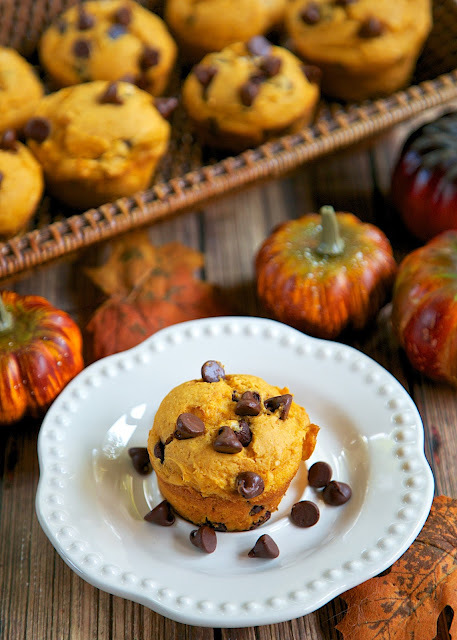 Only 4 ingredients to these quick and delicious muffins. I like to whip up a batch and eat them for breakfast or as an afternoon snack. YUM! It is starting to feel like Fall here. It is cooler in the mornings, the leaves are changing colors and there is football! Fall is my favorite time of year. I love the weather! 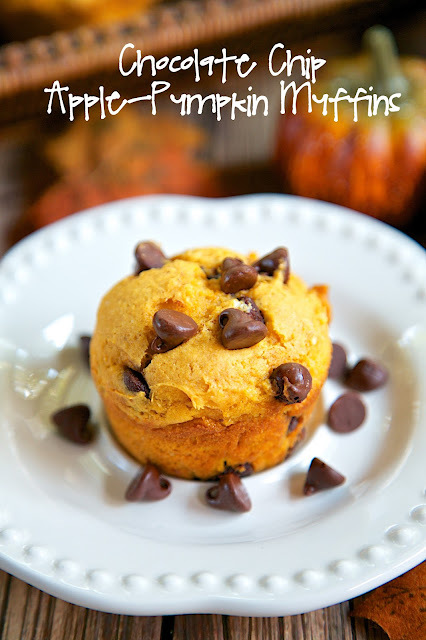 I also love that it is socially acceptable to eat and drink all things pumpkin! 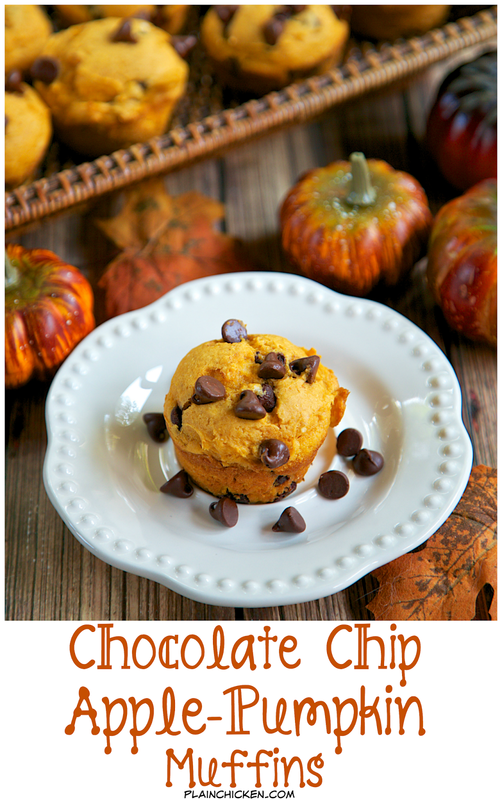 These Chocolate Chip Apple-Pumpkin Muffins are a super quick treat to whip up this fall. They only have 4 ingredients and taste great. I like to eat them for breakfast or as an easy afternoon snack. They only take a minute to make and are ready to eat in under 20 minutes. Perfect weekday breakfast! The recipe is from the new cookbook Lazy Cake Cookies & More by Jennifer Palmer. All the recipes in the book have 5 ingredients or less. These outrageously easy five-ingredient recipe “hacks” use shortcut ingredients like cake mix for decadent homemade desserts that taste incredible, but are perfect for the beginner baker or anyone who’s too busy to bake! Sugar cookie dough and pudding mix become Cinnamon Roll Cheesecake Cookies, brownie mix and instant coffee become Espresso Cookies, and angel food cake and lemon pie filling become the easiest Lemon Bars of all time! Plus, recipes for quick and easy no-bake desserts like cookie balls, fruit fluff, and mousse pies round out this fun collection. Preheat oven to 350 degrees. Line 12 muffin pans with liners or coat with nonstick cooking spray and set aside. Combine all ingredients and mix well. The batter with be thick, resist the urge to add any liquid. Fill muffin cups three-quarters full with batter. Hope I win!! Stephanie - I just got a cute fall themed (stoneware) bundt pan. I think this would be awesome in it but I wonder how long I should bake. 35 Minutes?? ?